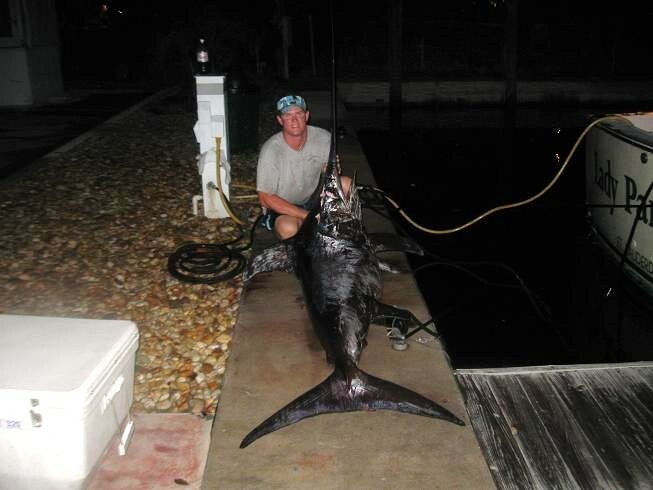 Broadbill swordfish are rarely taken on rod and reel in Australia. It is slightly more common in New Zealand, but still and extremely noteworthy and prestigious catch. 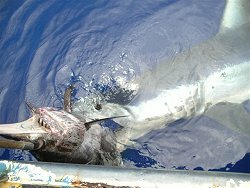 The best method for taking broadbill in Australia, appears to involve the use of whole, fresh squid and chemical light sticks fished 40-100 metres (20-50 fathoms) below the surface far offshore at night. Broadbill swordfish are blackish-brown on the upper body, fading to light brown on the belly, deep azure blue to bright metallic purple on the back when alive. The eyes are very large and black. Their fins are brown or blackish-brown. Their upper jaw extends into a long bill which has a flattened oval cross section. The bill is approximately one third of the fish's total length. Adults have no teeth or scales and they have a large keel on each side of the body in front of the tail The dorsal fins are broadly separated and there are no pelvic fins. The Broadbill Swordfish grows to over 4.5 metres and over 600kg. Broadbill swordfish are oceanic fish distributed through tropical and temperate waters of the Pacific, Indian and Atlantic oceans between 45ºN and 45ºS. They inhabit all Australian waters beyond the edge of the continental shelf. 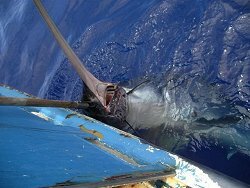 Broadbill swordfish tolerate a broad range of water temperatures from 5-27ºC, but normally inhabit waters with surface temperatures greater than 13ºC. The distribution of larval broadbill swordfish in the Pacific Ocean indicates that spawning occurs mainly in waters with a temperature of 24ºC or more. Spawning appears to occur in all seasons in equatorial waters, but is restricted to spring and summer at higher latitudes. In Australian waters larvae are common in spring in the Coral Sea. 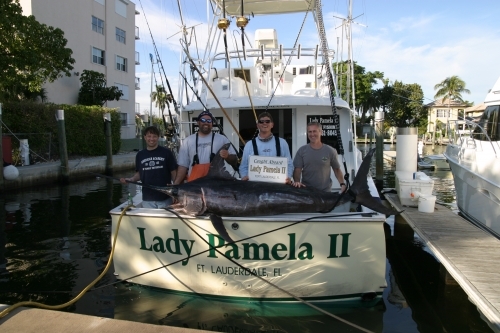 Broadbill swordfish with mature ovaries have also been caught in this area in October. 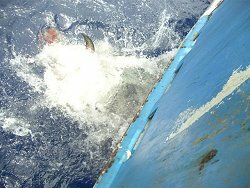 Broadbill Swordfish possess acute eyesight, with which they can locate prey, and their flesh consists primarily of ‘white’ muscle which provides energy for sudden bursts of activity, such as when in pursuit of their quarry.